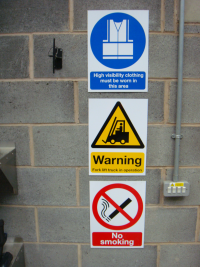 As a warehouse identification specialist and supplier of all kinds of warehouse signs, we are able to provide a range of safety signs that are used in the warehouse and distribution centres around the country. 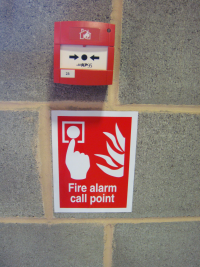 We are asked to supply common health and safety signs such as no smoking signs, fire safety signs and site safety signs to less seen signs such as tactile and braille signs. Our range is not specific purely to warehouse use as some of our customers do not operate forklift trucks or run a typical distribution facility, so our range is more varied than others. Safety signs are made from self adhesive materials, rigid plastic, and aluminium depending on where they are to be hung. Our signage range also includes floor safety signs and floor stencils which are designed and manufactured for use on warehouse floors, End of Aisle Signs, Load Notices, Hanging Signs, Dock Door Signs, Bus Stop Signs and bespoke signs. 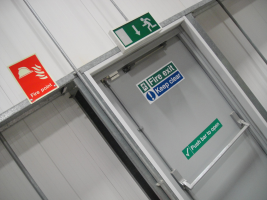 Most customers include safety signs with their orders of warehouse identification, so if you would like to add them to yours or include them in one of our installation projects please feel free to contact us. Installation services are provided by our experienced, in-house trained teams who work nationally and internationally on projects which are often time critical and commercially sensitive. . Our teams are equipped with the correct licenses, training and experience to install your hanging signs safely and in a professional manner.